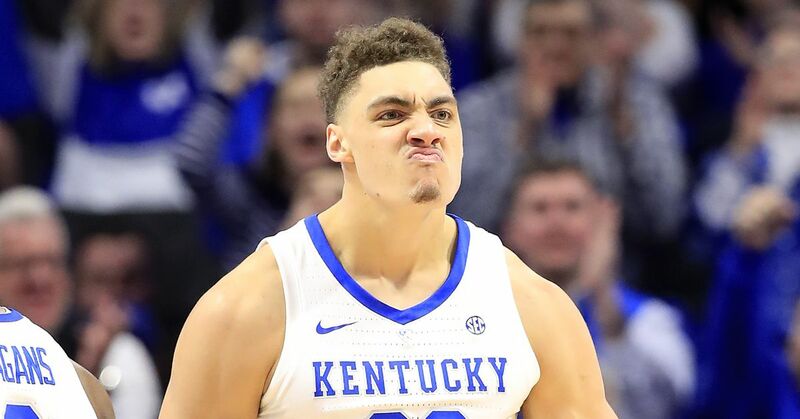 Travis was big on a bigger stage on Saturday night against the Jayhawks, scoring a team-high 18 points while grabbing 12 rebounds (seven on the offensive glass) in a 71-63 victory for Kentucky. This circle set was really going nowhere because Travis had to make a post catch further away from the right block than he wanted to and with Quentin Grimes coming down to “help” in a way, he had to kick the ball back out to Keldon Johnson . Washington gets the deflection and then catches a pretty lob from Ashton Hagans on the other end to fire up Rupp Arena and help the ‘Cats claw their back into the game. Notice how Travis gets himself a little wider to create more space when he runs the break to give a slot for Hagans to deliver a good pass for the easy deuce, plus a foul. He runs out of real estate and with Garrett and Devon Dotson technically over to help on his other shoulder, Travis make a tough (but good) pass to Johnson in the corner. The ‘Cats reverse the ball, Jemarl Baker Jr. misses the long two off a good fake and Travis virtually takes on the whole Kansas lineup for the bucket plus the foul.